Opposition to Jordanian gas deal with Israel grows as public protests and legislators attempt to scrap the deal. Jordanian plans to buy gas from Israel have aroused fierce opposition in the kingdom at a time of mounting criticism of the Jewish state's policies toward Palestinians. Parliament began debating the proposed gas deal on Tuesday, after 79 lawmakers in the 150-seat house filed a motion calling for it to be scrapped. "Gas supply is part of national security, so how can we link it to an enemy who does not respect its commitments?" asked Jamal Qamwa, who heads parliament's energy commission. "We are bound to Israel by a peace treaty, but it does not respect it... It is also attacking our people in the West Bank and in the Gaza Strip," he told AFP. "This whole issue is not about importing gas or about prices. Buying from Israel will make us hostage to the Zionist enemy," he said. US giant Noble Energy announced in September that Israel would supply Jordan with 1.6 trillion cubic feet of natural gas from its Leviathan offshore field over a period of 15 years. Leviathan is majority-owned by three Israeli companies, with 40 percent owned by Noble. A source close to the deal, which has yet to be approved by the Jordanian government, said it would be worth $15 billion (11.4 billion euros). The gas to be delivered to the National Electric Power Company would help reduce Jordan's annual energy bill by around two billion dollars. But critics in Jordan claim Israel has failed to meet its commitments to the 1994 peace treaty with Jordan and instead stepped up "violations" against the Palestinians. 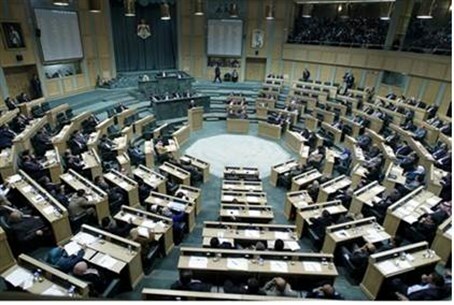 A week after the deal was announced 40 Jordanian parliamentarians submitted a memorandum the deal not go through. The 20-year-old treaty between Jordan and Israel is deeply unpopular among Jordanians -- almost half of whom are of Palestinian origin. The treaty was sorely tested by last summer's 50-day war between Israel and Hamas terrorists in Gaza. Jordan last month recalled its ambassador from Tel Aviv after Israel deployed police forces to the Temple Mount and the Al-Aqsa mosque compound during clashes. Jordanians have taken to the streets to protest Israeli "violations" in Jerusalem and urge the government to revoke the treaty with Israel. The Islamic Action Front, political wing of the Jordanian branch of the Muslim Brotherhood, warned that buying Israeli gas would bolster the "economy of the Zionist enemy and contribute to the killing of our people in Palestine". Despite the fierce criticism, Jordan's government has defended the proposed gas deal. "We will take strategic measures to address the energy crisis in accordance with the national interest," Energy Minister Mohamed Hamed said in parliament. Buying gas from Israel "does not threaten the future of Jordan nor does it leave Jordan's economy hostage in the hands of any country," he said. The minister said the deal could help avert more drastic measures such as daily power cuts or rising electricity bills. Hamed added that high energy costs have severely strained the economy in cash-strapped Jordan, faced with an external debt of more than $23 billion.